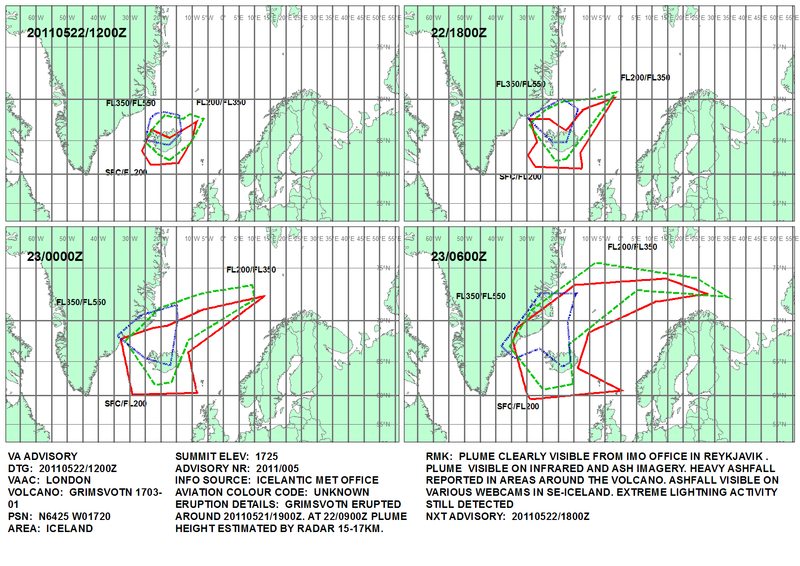 Iceland volcano eruption not likely to disrupt air travel | Watts Up With That? STOCKHOLM, May 21 (Xinhua) — An eruption has started in Iceland’s most active volcano Grimsvotn, according to reports reaching here from Reykjavik on Saturday. The smoke from the eruption can be seen from many places in south Iceland, Iceland’s television channel RUV said in a report. 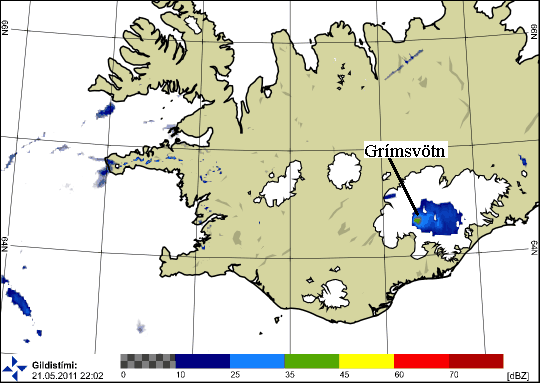 Iceland’s Meteorological Office also confirmed that an eruption had begun in Grimsvotn. “All indications are that an eruption will start in this area,” Icelandic geologist Hjorleifur Sveinbjornsson was quoted as saying earlier on Saturday by the local media. But scientists in Iceland believed that the new eruption in Grimsvotn could be small and would not lead to a repeat of the air travel chaos in Europe one year ago, which was caused by ashes from the Eyjafjallajokul volcano’s eruption. Located in the middle of the Vatnajokull glacier, Grimsvotn is the most active volcano in Iceland, with major eruptions recorded in 1922, 1933, 1934, 1938, 1945, 1954, 1983, 1998 and 2004. Most of the eruptions lasted one to three weeks. Anecdotal evidence is that this eruption is larger than the 2004 eruption. Current estimates are for the ash cloud to be 18km to 20km in altitude. At the latitude of Iceland, that is a stratospheric injection of material. Hey! No Fair! I’m supposed to fly from Frankfurt to Calgary today….usually right over Reykjavick! Poo! It’s the Rapture!! God’s just starting small. Believe me, this is the end! At least this is a volcano we can pronounce. If this thing doesn’t settle fairly quickly and keeps honking at those altitudes then the high end September NSIDC Arctic minimum ice extent predictions are looking more on target. Not fair, I just back from two weeks of taking photos got some good ones, but those shots would have looked a lot better. Maybe next year when I return. where else would I get such wonderful comment first thing in the morning. At least this time authorities are actually going to the site to assess actual dust/ash levels etc rather than relying on a computer model/prediction. Well I woke this morning and everything looks as normal. So another wrong prophesy. Volcanoes do their own thing so this eruption may be completely different to previous ones from this volcano. Different magma composition, different ice cover, wind changes, are but three variables that will change the air traffic problems. Let us hope for the best, plan for the worst. A really beautiful photo. 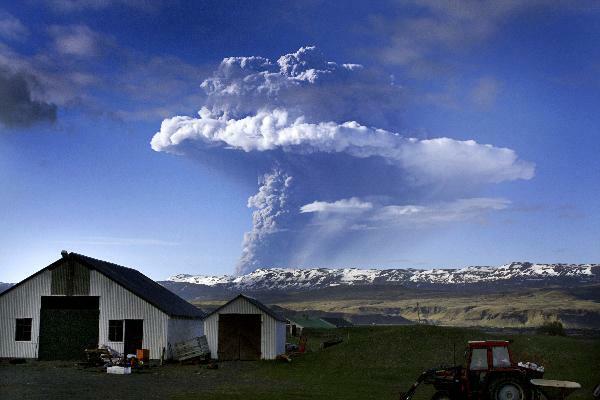 The Icelandic people are lucky that they get to see a small eruption like this happening in their backyard. I’ll respect you in the morning if you can explain, in unequivocal terms, the mechanism of the cloud formation that is annular to the volcanic plume. With an ash plume risen to an altitude of 20 km and the latest assessment that this is the biggest eruption of the past 100 years I think it is “very likely” that air travel is going to be disrupted. Hopefully this eruption dies down soon. At least in S. England we had about a month or excellent weather, comparable to summer months. From now tanks to Grim-whatever it may be all downhill. Only yesterday some newspapers were predicting hottest summer ever, wouldn’t mind that, but hopefully not a ‘year without summer’. Estimates are that the eruption is 10x larger than the 2004 event, and the biggest at this volcano in 100 year. Icelandic airspace is closed. Ash cloud went to 20km or over 60000 feet. I guess the real impact will depend on how long it goes on for and the wind direction though. Normally, in Western Europe, the weather travels from SW to NE. Last spring (I know I was there) there was a blocking high in the Atlantic bringing the dust cloud NW to SE. That pattern was what stuffed air travel. I spent April 2010 outside, building a shed in my brother’s garden. I’m 59 years old, and that’s the first time I’ve picked up sunburn in April. I doubt those conditions will hold this year. Does mean that the end may still be near? The eruption was described in the local news at noon that it looked like “10 times more powerful than Eyjafjallajökull” last year. Could that annular cloud relate to a slightly warmer moister layer of air? At what height does the stratosphere commence in May? Maybe this eruption will put some fine particulates and sulphuric acid into the polar cell. If so, the UK Met Office might want to revise their “hot summer” forecaste before they shoot themselves in the foot (again). The two largest Pinatubo eruptions and the largest El Chichon eruption only got to 24 kms high so this eruptive column is close to equivalent in height. It is only the stratospheric eruptions where the sulphate aerosols reach into the Ozone layer that seem to affect the climate. Hopefully, there is only one blast (with the small amount of eruptive material that seems to have occured so far) reaching 20 kms and higher or we are looking at up to 0.5C of cooling in the 18 months ahead. I will bet some yo yo comes up with a peer reviewed study which blames this volcano on Global waring which essentially stopped in 1998. Don’t laugh there was just such a story after the last one. There was one after the earthquake in Japan blaming that on Global Warming too. Do they think the public is so gullible they will believe anything ? I read USA Today which is a member of the “climate crusade” I think they are the Knights Templar of Global Warming. Al Gore is the Pope and Dr Hansen is one of the cardinals. Adam says this is the Rapture. I ‘m sure he know more about this than I do, but I’ll wait to hear what Eve has to say. “Grímsvötn has a southwest-northeast-trending fissure system, and the massive climate-impacting Laki fissure eruption of 1783-1784 was a part of the same fissure system. Grímsvötn was erupting at the same time as Laki during 1783, but continued to erupt until 1785. Because most of the volcano lies underneath Vatnajökull, most of its eruptions have been subglacial”. If this information is correct this eruption could last several years. [reply] Bandwidth alert: Big image! Could someone explain the possible effect on the arctic ice melt this year. I have not built up sufficient knowledge yet to know what the consequences could be. Plot of plume height versus the tropopause. It’s a bit old but gets the idea across-this is definitely a stratospheric eruption. The number of references to global warming, climate change, or greenhouse gases made on the internet or in other media. During the 2009 Copenhagen Climate Change Conference, the increase in climate pollution was at an all time high. No. There is no “smoke” there. Your scientific accuracy is, as ever, wayward. If a volcano is eruptin under an ice sheet, where does the melted ice go? Are we going to see some increase in sea level for the warmists to panic over? Gosh, I hope they don’t lose their bridge again. I’m not sure they could afford to replace it again right now! Nah… global waring is still going on. Cambodian and Thai troops exchanged gun fire just this year, and there is the whole middle eastern thing. Stevo, when one is basically quoting a news agency it is common practice to use their words. The fact that a news agency screws things up shouldn’t surprise anyone especially one who depends upon such fact distortions to get their message out. Thanks for the link. I extracted this from it too. There seems to be a discrepancy between the image on the original link and the above link, with ash heading south on the former, but looking like it’s heading northeast on the latter (if I’m reading this correctly). I’m keeping a close eye on this, as I’m flying into Europe this week. Any experts here have a data-based opinion on the aviation situation ?? We were flying today from Vancouver BC to London and the plane veered several hundred miles to the south from our original vector. Thanks guys. I’m flying Chicago – Brussels on Wednesday. Should be OK, I think. She spoke on condition of anonymity because she wasn’t authorized to be quoted by name. Superb photos of the eruption. Tantalize, we sure seem to think alike??? Geoff Sherrington, my take is that means there is a lot of steam is in the plume and that steam has made contact with cold air aloft. Ejafyallajökull made massive cloud cover and humidity, some is still aloft. In part from the mostly below stratosphere plumes, but mostly from melting 100 million cubic meters of ice into steam. All eruptions have a large steam component, but some have a massive steam composition like Ejafyallajökull. The recent eruptions in Chile, Alaska, Kamchatka, Iceland, Indonesia, Japan, Philippines and Ecuador (to name a few) all put a lot of steam into the atmosphere. As well as ash and gas aerosols to boost cloud formation. So more more flooding is on the way for some parts of the NH. It’s aerosols and altitude in my humble opinion. 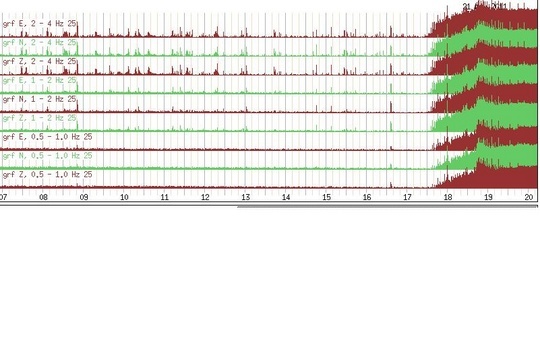 Jón Fríman called it right, I posted 8 months ago that he and others were saying that this volcano would likely erupt this spring. Oh, pardon my sentence structure, andriodx only gives you a little giggy box. Dragging out the PC hassle. 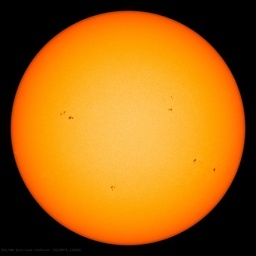 Pardon also to all the galactic cosmic ray heads, but no volcanic eruptions = ‘sunny days that I thought would never end’. Eruptions. = ‘raindrops keep falling on my head’. Simple, though GCR’s may enhance this to some degrees. Since Pinatubo and Cerro Hudson, and particularly since 1995 the eruption numbers and VEI volume has increased and slowly temperatures have flattened and even trended downward a bit. Not that we don’t still have a few hot years when the aerosols are at low altitudes. Anthony, I think you need a new thread on this with a less unfortunate title now we have seen some flight cancellations..and threat of more over Western europe thanks to winds arriving from Iceland from tomorrow! The volcanoes are the easy bit, it’s the glaciers they’re under that are the hard thing!